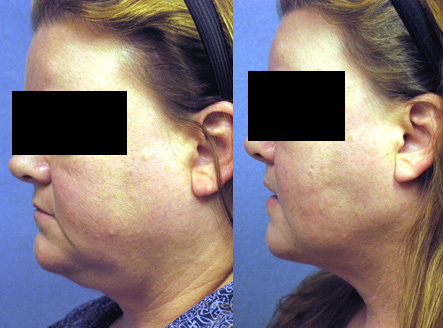 Redo Liposuction of the neck in Los Angeles by Aaron Stone MD can remove a double chin. This 45 year old, 5’4″ tall, 230 lb. 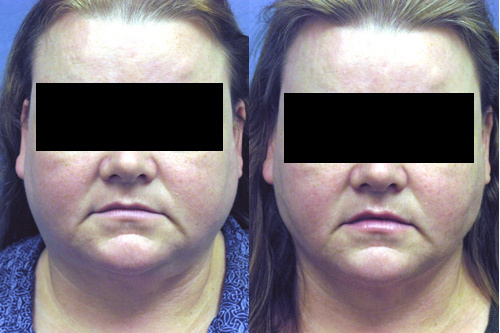 patient had neck liposuction performed elsewhere and was unhappy with the result. The previous surgeon did not account for natural surface contours such as the concavity under the jaw line and also performed asymmetric removal of fat leaving the patient with a lump of fat on the left side. Accounting for the natural contours Dr. Stone was able to achieve a more esthetic more symmetric result with greater definition of the jaw line and a slight concavity in the cheek area to accentuate the normal convexity of the cheek bones by performing redo liposuction of the neck. In order to achieve an optimal result the surgeon has to assess where the fat is concentrated by finger pinch because it is not evenly distributed under the skin. Then he or she has to account for natural body contours (concave and convex surfaces) during the removal process to recreate these contours. This is made more difficult by the common use of fluid injection just prior to liposuction removal of the fat — tumescent or superwet liposuction. Overly aggressive removal to just get fat into the liposuction cannister can damage the overlying skin causing pigmentation changes and/or scarring and pitting or unnatural surface contours. At the extremes these irregularities are not fixable. If the surgeon does not appreciate the normal contours along the jawline and try to emulate them the result will be inadequate. The recovery is quick, even in redo cases such as this, so if the procedure is done on a Friday the patient wears a compression garment at all times over the weekend and returns to work on Monday only wearing the garment when not out in public from that point for 3 to 4 weeks.